The latest Word, Excel, PowerPoint and Outlook iterations, issued as version 16.20.0, enable support for tentpole macOS Mojave functionality, according to release notes provided alongside today's update. All four Office apps now benefit from compatibility with system-wide Dark Mode user interface aesthetic. Introduced with Mojave, Dark Mode toggles UI elements like window borders and icons from standard, brightly lit color to a darker scheme designed for use in low-light environments. 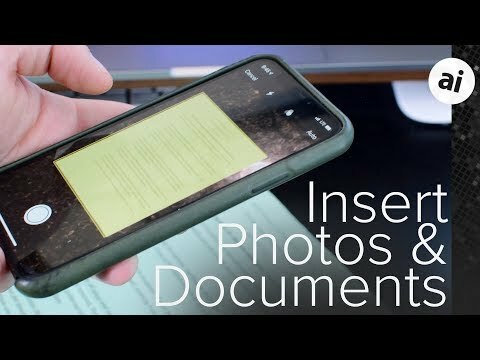 In addition to Dark Mode, PowerPoint integrates Apple's Continuity Camera, which allows users to insert photos taken from an iPhone into an open document. As implemented in PowerPoint, users open a presentation, select a target slide and perform a control-click operation to bring up an edit menu dialogue. Selecting a paired iPhone triggers the Camera app on that device, which can be used to take a photo for insertion. Beyond Mojave-specific capabilities, the latest Office version includes embedded fonts for Word and new features in Outlook including calendar sharing, meeting forwarding prevention and support for Teams. The update is available to Microsoft Office 365 subscribers, who will see the update download automatically, as well as licensed owners of Office 2019 for Mac. I'm trying to figure out what the big deal is with dark mode. I tried it - things looked different and often times it mad ether interface lest clear. (ex: try to tell if you're in a private browsing window in safari with dark mode!) In the end it really didn't matter and I switched it back. Beyond that, I have to use Outlook for work, and man is it a PITA to use! I am trying out dark mode, which I thought I would like because I use Photoshop all day long and so I work in a dark office for color accuracy. So far I’m not liking it too much. Windows are more difficult to make out in Safari and everything just kind of blends together. I’m going to stick with it for awhile longer to see if I can get used to it. Also because bright white screens tend to tire my eyes more the older I get. Like so many of these kinds of features its something the design engineers think is cool or some people asked for. I tired dark mode too and soon returned to regular mode. I guess it’s supposed to be easier on the eyes for those who stare at a screen for 10 hours a day or something. But i installed the Office updates without issues and have to say that an Office 365 subscription has worked out well for me and my wife. The 1TB One Drive account included is nice along with Skype. I don’t mind the subscription model for apps that I use everyday and are important to me for my data and finances, like Quicken. You’re always on the latest version and have little to worry about when it comes to compatibility with macOS or iOS. I tried dark mode for a week. I liked the look on the screen but I often have to print what I see on the screen including emails and contact cards. Unless I am interest in buying stock in HP to try an recoup the money I would spend on black toner cartridges, I decided dark mode is not for me. I love dark mode (only not for the Apple Mail - the backround is just almost black). At work I even have a "Darke Reader" extension for Chrome (try it - it's really cool for lot's of reading while browsing). I love dark mode and use it 100% of the time. Your brain absolutely needs time to become used to it, but that’s to be expected. I love dark mode....its a feature of macOS I've been waiting for years! My Mac is permanently set to dark mode. I think it's a much nicer interface. I wish iOS had a full dark mode too. I use dark mode in the Kindle App on my IPad (7+ years now) and will never go back. My guess is it needs to be App (or website) specific rather at the OS level to work well. For example, having a dark mode selector in Safari and Word to easy switch back and forth. I do use dark mode on royalroad.com (webnovels) and it works well. As it is currently implemented, it is useless in Word because the “dark” part of the equation only affects the window chrome, not the actual pages and content. I find myself having to trigger light mode and invert both all colours and my highlight colour (before the days of Mojave I had a script for that, but it ceased working) to get a true, system-wide dark mode. Then, I can finally work in Word properly. To top it off, I run f.lux at the strongest day and night settings respectively, which makes my screen look like an amber monochrome CRT. Full disclaimer: I am finishing my MA dissertation, so I have to spend hours on end daily either writing in Word or reading PDFs, so I guess I’m one of “those people” this thing is aimed at. And it doesn’t work because neither Adobe nor Microsoft give their users a chance to make the actual content dark (I don’t care whether it breaks the WYSIWYG paradigm; as long as the software in question educates the end-user about that upon triggering said features, it should work out fine). Well, here, there was a failure on Apple’s part in not explicitly educating the end user. Obviously, said e-mails would not print as white on black; on the other hand, had you tried to do a print job, you’d have seen that for yourself in the print preview viewport on the print dialog/sheet. As for WYSIWYG Microsoft apps, it is indeed possible to make Word documents white on black; those, however, would indeed print as white on black, and I would have the inverse problem whenever printing out copies or sending out PDFs for my tutor for revision. I just want a non-WYSIWYG theme setting like the one Word for Windows users had for years (and yes, I know that setting was probably aimed at diehard fans of Word for MS-DOS, but still; I care only for whatever is easier on the eyes). I'm just happy to have the option of having dark mode, in general, regardless of personal preferences. Some people like it and some people don't. No big deal. My only complaint with dark mode in iOS and macOS is the inability to apply it more widely and consistently across the entire user interface. The "smart invert" feature on iOS has too many instances where the dark mode algorithm messes up the display of visual elements like embedded images. It all comes down to the same question: do you prefer to have a personal product that can be made to conform to your preferences or do you prefer a personal product that makes you conform to the product designer's preferences? With hardware you typically have no choice or very little choice, e.g., silver, space gray, or rose gold, due to physical constraints and cost. With software the choices do not have to be quite so stark because software is extremely malleable, although cost is still a constraint. Sure, this is not a binary situation where there are overarching standards that must be enforced, e.g., stop signs should probably not suddenly be pink and green, but where personalization makes sense, I'm all for having the option to make the product conform to my preferences. This is especially important when my preferences are influenced by the environment that I am using the product within or factors that affect me in a unique way. As it is currently implemented, it is useless in Word because the “dark” part of the equation only affects the window chrome, not the actual pages and content. Are you using the new, just-released version of Office the article is describing, or a previous version? Question: So if you subscribe to Office 365, do you get to (download and) work in the full Mac OS version on your Mac and not in some browser version? And other than how you pay for it, are there any particular pros and cons between going with one or the other ways of purchasing (besides being licensed on multiple devices)...??? I am an Office 365 subscriber and can verify it is the full version of Office Mac including Word, Excel, Powerpoint, and Outlook, the same version you get if you buy the standalone product. You download the full version directly from Microsoft. Instead of a product key your use of the product is tied to your subscription account. You also get 1TB of storage on OneDrive and 60 minutes of Skype per month. Once you go Dark, ….You never go back !! MS products were already dark in every way, nothing new. I do. My copies of Lightroom, Photoshop, Word, (Quicken when I used to use it), are quite old and paid for...if I were paying constantly every month I'd have spent thousands more on them, for the same jobs. It's like leasing a car indefinitely rather than simply buying it outright. For non-enterprise users, we really don't need to pay a monthly lease to have the latest builds of these apps, as the primary functionality is well covered. The Office update also includes new, cleaner looking icons in the ribbon too. A much finer line is used on the icons, which renders nicely on a Retina display. I can't offer any opinion on Lightroom or Word as I don't use them, but I can tell you that Photoshop has actually improved a lot since v.6. I hate hate hate the premise of subscription software ("Pay in advance and we'll deliver something at some point, you just won't know what or when or be able to decide if its worth the cost for your uses"), and I cancelled my subscription for the full Adobe CC suite after the discounted first year. Then they offered Photoshop with Lightroom for $10 per month, and I bit. I keep wondering if Affinity Photo or Pixelmator might satisfy me (I actually like Affinity Design better than Illustrator), but to know for sure I'd have to do every project twice, so I could compare the results of things like masking hair, edge detection, etc. Who's got time for that? Anyway, you might want to give the basic Photoshop/Lightroom subscription a go. It's relatively inexpensive and the product really is better than the last version I owned outright. Dark mode doesn't affect printing, only the display on screen.